From the Bon Appetit October 2006 issue. For the soup, first sautee the onions in butter. Then add chicken broth, chopped cauliflower, and optionally, the diced potatoes. The potatoes add a thick texture to the soup, and it may not be for everyone. Simmer for ~ 20 minutes, or until cauliflower is softened. Add cream, simmer some more. Puree with food processor/immersion blender. Sear scallops with butter, ~ 1 minute per side. 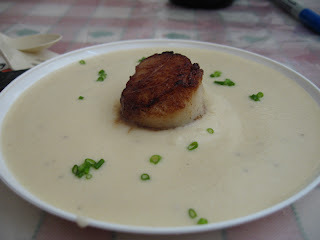 (depends on size of scallop). Add to soup, garnish with chives.